The possibility of solar energy becoming a reality in Hemingford was discussed some more during the Village of Hemingford Board of Trustees meeting Tuesday, Sept. 19. 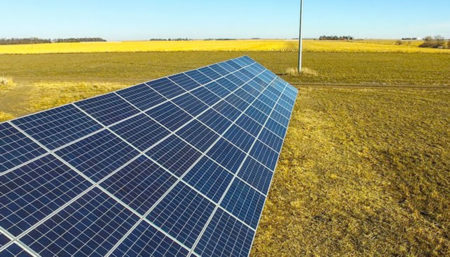 The board was given more information from GenPro Energy Solutions, a company that has been at several meetings to discuss the possibility of utilizing solar energy in Hemingford. Molly Brown, Vice President of Energy Production, gave the board members handouts to show what a one megawatt solar farm structure would look like in Hemingford. The handout showed 3,436 320-watt solar panels. Brown explained that they use northwest facing solar trackers that sit in rows from north to south and follow the sun from the east to the west. This entry was posted in Nebraska / Midwest News, NewsBlog and tagged GenPro Energy Solutions, GenPro Energy Solutions Vice President of Energy Production Molly Brown, GenPro Energy Solutions' Vice President or Energy Production - Molly Brown, Nebrzskans for Solar, Star Herald, Village of Hemingford on September 24, 2017 by Helen Deffenbacher.